If you're planning on traveling to Germany in the winter, you're in luck. This can be a cheap time to travel, and you'll find much less crowds than in the peak summer season. On top of that, this is the birthplace of modern Christmas, world-famous skiing, and vast discounts. Expect to see beautiful lights strung up for the holidays, cheerful Christmas markets, cozy snow-covered streets, and more. Plus, there's delicious mulled wine to keep you warm. Bundle up! German winters are cold, with temperatures often dropping below zero. Expect snow—sometimes a lot of snow. German winters can be unpredictable, and you should always be prepared for rain or the special blue skies and sunshine day. Weather in Germany can change quickly – often in the course of a day. So be prepared when packing for all conditions, particularly the biting cold in winter. Essentials like stylish, good walking shoes are a given. Scarves are also commonplace for men and women whenever the weather turns cool. For winter, you should also invest in a quality jacket. This doesn't have to be wildly expensive or sporty, but look for something that really seals in the heat. There are few things worse than realizing your jacket isn't up to the German winter. Also buy boots that can handle slippery ice as well as freezing cold. Help them out with some decent socks. Top with gloves and a hat and you should be ready for most winter days. It is not uncommon to need an additional layer of protection if you plan a long-day of sightseeing outside. In these cases it might be worth wearing some thermal layers under your clothes. In a pinch, this can be just tights, or you can go full German and buy specific garments to protect your kidneys (seriously). For outdoor activities like skiing, of course you should be prepared with water-proof ski suits and gear. And you can always plan on warming up with some traditional German glühwein (mulled wine). Some of the best festivals and events in Germany are in winter. Find out what’s happening in Germany, throughout December, January, and February. Christmas markets: Christmas markets are a wonderful part of the German holiday tradition and a great way to get into the Christmas spirit. Every German city celebrates the season with at least one Christmas market, usually from the last weekend of November and until Christmas Day. Bigger cities have a plethora of markets to choose from. Try to hit all the best Christmas Markets in Germany from Nuremberg to Munich to Dresden. Winter sports and skiing: Looking for some action-filled vacation? From the Alps to the Black Forest, Germany offers many winter sports areas, whether you are into downhill skiing, cross country skiing, or snowboarding. In turn, these chilly conditions result in some great winter sports in Germany, especially in higher German regions such as the Bavarian Alps. Downhill and cross-country skiing is plentiful and usually much cheaper than places like Switzerland and Austria. New Year's Eve: Germans celebrate New Years (or Silvester) on the eve of December 31. Join the locals in looking for the mustard doughnuts, drinking sekt (champagne), looking for signs in lead, marveling at the many fireworks, and partying way past midnight. If you want to participate, buy your own feuerwerk (fireworks). Before the big night they are on sale at every German supermarket and pop-up stand. If you want to join Germany’s biggest New Year Eve Party, head to Berlin’s open-air party at Brandenburg Gate. Airfare and hotel rates tend to go up at the end of November when the markets open to the end of December. The traditional German Christmas Markets draw thousands of visitors from around the world. 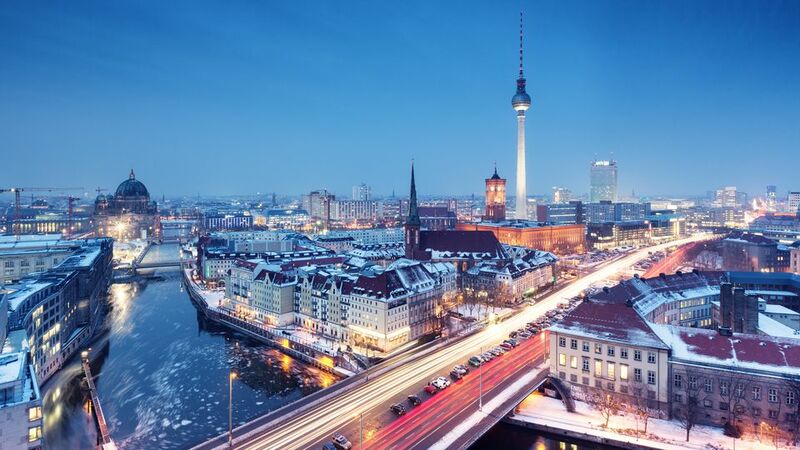 January and February are the most affordable time to visit Germany. And there are far fewer crowds as the holiday season ends.